In its bid to get out of poverty, the Bihar government has finalised a plan to drain out lakes and convert them to farmlands. But it seems to be unaware of the ecological consequences of such moves. KABAR Tal, a 7,500-ha lake in Begusarai district of north Bihar, is ecologically one of the most important wetlands in the state. The lake hosts 106 species of resident birds and is a nesting ground for 59 species of migratory birds. In addition, the wetland supports a large number of flora and fauna round the year. Economically, too, the lake is significant because it yields about two tonnes of fish everyday and is the single biggest source of irrigation in the area. As a result of all these factors, Kabar Tal of late has drawn national and international attention and the Union government has identified it among the wetlands of national importance -- the only one with this designation in Bihar. 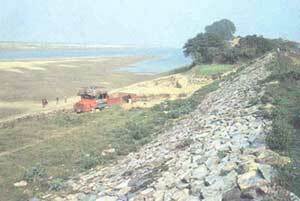 Recently, the state government of Bihar has also begun to take interest in this vast waterbody. Unfortunately, such concern is bad news for Kabar and all those who value its biodiversity. An influential section of the state government wants to drain the water out of Kabar and convert it into farmland. The prime architects of the scheme are officials of the water resources and the agriculture departments and the local MLA, Ramjeevan Singh, who feel that the lake has marooned "prime farmland" and it would be a service to the farmers who have their names entered in the state revenue records as owners of the lake area. If Kabar is dried up, Singh, who also currently holds the agriculture portfolio in the Bihar cabinet, is sure to boost his electoral prospects with the powerful upper caste farmers in the area. Ironically, in the state capital Patna, the scheme is supported by those who sincerely want to pull Bihar out of its vicious poverty. One of them is the water resources minister, Jagadanand Singh, who thinks that a state with an acute shortage of foodgrains should strive to use every single inch of farmland. To the engineers in his department, it simply means that a drainage scheme should be made for Kabar Tal. The scheme is ready and if Kabar lake still survives, it is largely because the government does not have the money to execute the drainage project. Kabar is by no means the only wetland facing the grim prospect of being drained out. This was evident at a three-day workshop on the conservation and sustainable use of floodplain wetlands, organised in Calcutta by the British Council and the Asian Wetland Bureau. The workshop brought together wetland scientists, managers, officials in charge of "developing" floodplains and members of some non-governmental organisations (NGOs). However, what emerged at the end of the workshop was that most "development" departments of the government are still unable to look at wetlands -- known locally as chaurs or beels -- as a complex of economic and ecological resources. There is still a tendency to view natural wetlands as either waterlogged land or a single economic activity resource like fish ponds. The state forest and environment departments, assigned to "conserve" them, take their task to be merely enclosing them to the rest of the world. Says V S Vijayan of the Salim Ali Centre for Ornithology and Natural History, "These people have not learnt anything from the disaster caused by a similar strategy for managing wildlife sanctuaries and national parks. Today, most Indian sanctuaries and national parks have become law and order problems." Vijayan says the implication of these attitudes is even more dangerous in the case of floodplain wetlands. Sinha, who has been working on resource management in floodplain wetlands for about three decades, warned the workshop against devising a strategy that did not take into account the people who drew their livelihood from these wetlands. He argued that these wetlands were not important merely because of their biodiversity. "Millions of people all over West Bengal, north Bihar and the Brahmaputra valley depend on these wetlands for their survival. The floodplain wetlands are like islands surrounded by these people and no scheme of conservation would work that does not allow them to use these wetlands for their survival needs," said Sinha. On the other hand, says Sinha, if the biodiversity conservation strategy for the floodplain wetlands also promotes disciplined resource use by the traditional beneficiaries, it could contribute significantly towards improving the life of the traditional beneficiaries. If biodiversity conservation is to make sense to the local people, the conserved habitat must also bring in economic benefits to them. But the integration of resource use with habitat conservation is something that still meets with resistance in official quarters. Another important bottleneck in sustainable conservation is the segregated approach that many official agencies still follow. The workshop clearly highlighted this. In fact, the emphasis by one group at the workshop on developing fisheries led a participant to complain that it should have been more appropriately called a workshop on fisheries development. This attitude persists despite the fact that all the official initiatives for the development of fisheries during the past two decades have done little to save either the wetlands or the fishing community in an area like north Bihar. Though quality fish sells cheaper than potatoes in Kusheshwar Sthan in north Bihar, at the district headquarters of Darbhanga, cultured fish is procured from states as far away as Andhra Pradesh and Tamil Nadu at rates higher than Rs 40 a kg. The story is more or less the same in the other areas of north Bihar and many parts of the Bengal floodplains. The Assamese experience is not much different, either. The fisherfolk in Kusheshwar Sthan complain they are unable to carry their catch even to Darbhanga because of a lack of transport facilities. As a result, large sections of fisherfolk in Kusheshwar Sthan have switched to agriculture and those who could not afford this have moved to cities as wage labourers. If anything, this trend has accelerated the decline of the wetlands in the area, which more people covet for encroaching upon and farming. The plight of Madhubani, another floodplain district with 6,000 ponds, is even worse. Though several ponds and other water bodies have been reclaimed for agriculture, many of the remaining ones are so badly degraded that their fish catch has dropped heavily. Fish almost all over the area have developed diseases, particularly ulcers, over the past three years. This has further aggravated encroachments because many fisherfolk also do not see a future in fishing and abet encroachments. The lesson to be learnt from this is that the rights of traditional users must be respected while making conservation strategies, says Hemant, a Patna-based journalist who has studied the north Bihar floodplains. But that is something a large section of policy makers within the government still find unacceptable. For instance, O P Lal, the chief conservator of forests and chief wildlife warden of Bihar, argued at the Calcutta workshop: "These are very crucial issues and they cannot be left to local communities and NGOs." Many others echoed similar apprehensions, though not so vocally. Another hurdle in the development of a sustainable conservation strategy for the floodplains is the lack of adequate databases, as pointed out by A K Ghosh, the director of the Zoological Survey of India (ZSI). Environmental profiles of the floodplains are not yet ready, says C L Trisal, scientist in charge of wetlands at the Union ministry of environment and forests. Though studies have been carried out by agencies like ZSI, the task is far from complete, he says. Sinha of IWMED also finds fault in the way data are collected by scientific institutions. He says there is still a "tremendous reluctance" among scientists to consider the traditional knowledge of the local communities important enough in biodiversity assessments of floodplain wetlands. The knowledge of the local people can often be a valuable beginning in assessing these resources and at the same time, it should also be used for understanding the scientific data. But professional scientists are still not convinced. However, the biggest problem continues to be the inability of the development agencies to understand and restore the functions of floodplain wetlands. "In practice, the management of these wetlands is largely the sum of the unplanned, uncoordinated and often cross-purpose pursuits of individuals, groups and government agencies," said Basawan Sinha in his paper on the problems of north Bihar wetlands. The most glaring evidence of this is the flood control policy of the governments of these states. Even as the workshop participants devised ways to restore the functions of floodplain wetlands, the representative of the water resources department of Bihar, R R P Sharma, argued for strengthening the flood control embankments to "combat" floods. Though Sharma agreed "a limited amount of flooding was necessary", he said his department still felt that building high dams in the upper reaches of the Himalaya was necessary for the people of north Bihar "as it would save them from the ravages of floods". This is the problem with a segregated approach, says Subrata Sinha. "How can one even think of building dams in such a highly seismic zone as the Himalaya?" asked G E Hollis from the wetland research unit of the department of geography at the University College in London. In any case, said Hollis, it is the disruption of the hydrology of the floodplains that is largely responsible for the sad state of wetlands there. But this realisation, it seems, comes only the hard way. The engineers from the Brahmaputra valley appear to be far more responsive to the new dimensions of flood management. In fact, at the workshop, the working group on Assam, which included flood control engineers, decided to recommend a moratorium on new embankments, a suggestion that some representatives of Bihar and West Bengal did not find palatable. The progressive trend among Assam engineers is also because they have suffered the most as a result of their flood-fighting policy, says Sinha. Should that be true, the inhabitants of Bihar and West Bengal floodplains are destined to face lot more misery and environmental degradation before wisdom dawns on their official machinery. For the wetlands of Bihar, in the meanwhile, there seems little hope because the state government is under pressure to dry out almost all 400,000 ha of floodplain wetlands. The threat becomes even more pronounced, as a state government official points out, because reclaiming wetlands makes better political rhetoric and costs much less than big water resources projects. A bankrupt state government, when under pressure from the people to do "some developmental work" in the area, just may find it convenient to come with a chaur drainage scheme.